A good friend and member of WTVH,Paul came over today to go and do a little day hunting. We headed out after lunch to a ranch that Paul hunts on. When we got there I seen that it was a lot dryer than the last time we were there. The drought has been hard on us here. Plus we saw a lot of dead cows that the drought didn't help. Some hadn't been dead for to many days. We road for awhile checking water holes for signs. Not to many coyote tracks were seen today. We checked out the dry lake bed but nothing was moving at that time. Late that afternoon we came up on some dead cows. As we were driving Paul stop the truck and said "there's a coyote"! As I was looking for the coyote I was moving my rifle up to my shoulder. I found him on the other side of a bush. Just a few yards away from a dead cow he must have been eating on. He was looking right at us. I was looking for a hole in the bush to shoot through. I found one and from my Rem 700 I let a 45 gr JHP 223 Rem go. And in just over 100 yards and through the bush the bullet found it's mark. So Paul and I got back in the truck and headed on down the road. A little ways down from where the first coyote was taken. I heard a calf crying for it's mom. I asked Paul to stop cause I saw something. I checked closer and could see it was the calf. He was the same color as a coyote. We then start back down the road. When I saw a coyote running left of the pickup. Paul stop and I got out and put my scope up to my eye. He was running at a nice gallop. I barked at him with no response. So I put the cross hairs just in front of him so we he came to the spot that I picked I squeeze the 6 oz. trigger on my Rem 700 and turn the bullet loose. 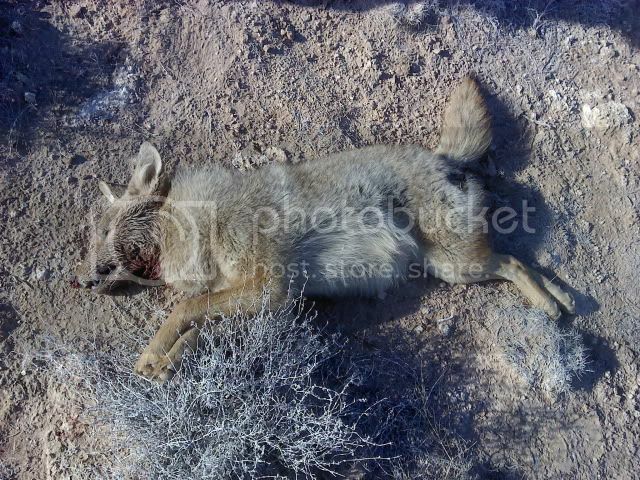 I lost the coyote when my scope jumped up. We didn't see him. Told Paul I would walk out and check and see if I had connected with him. When we got haft way there I saw him down but still moving. The bullet had went in his back and broke his back and came out and broke his left hind leg. I put him down and was glad that Paul and I went out to check on him. He would have had a long hard death. It was a good day. Time spent was a good friend and did some hunting as well. Don't get much better than that my friends. Thanks Paul I had a great time my friend. good to hear you had a good day out. 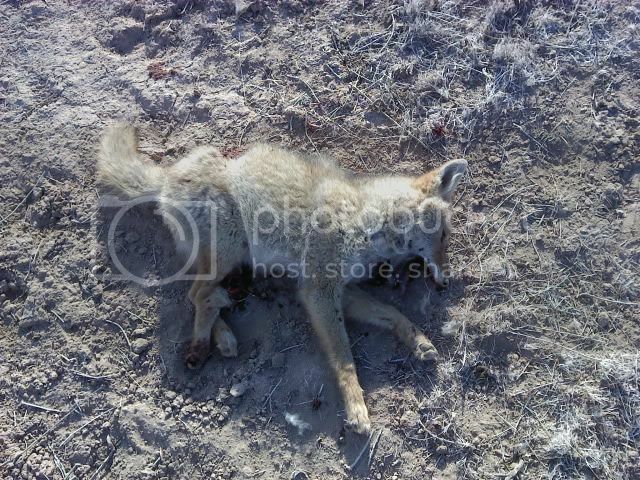 those coyotes look smaller and fluffier than other pictures I have seen?? are they a different subspecies the coat sure looks thick for a summer skin what is the story with them??? They look like pups. The tails are real short and heads are smaller compared to the body. thanks for clearing that up ITD. makes sence. The first one is over a year old and the second one is less than year old. It is still not summertime here. The coats are thick and good due to the steady diet of beef. Due to the drought most ranchers are having to feed their cattle due to poor grazing land. Some are having a hard time at it because the cows will eat the mesquite beans which is ok in moderation. But when the diet consists of mainly mesquite beans it creates a poisonous gas in their stomachs and it kills them. So the coyotes have plenty of beef to eat. I can see by the teeth that the first is older than the second dog. But I should think that either the diet of these dogs that it isn't the greatest or that they are from a late litter. I haven't hunted dogs down south but I would think that they really don't get a large as the ones (coyote/red wolf hybrid) up north here or in eastern Canada (eastern Ontario and east), the reasons being, the conservation of energy for animals, or genetics but still I would expect them to be larger. The coyotes west of the big river have alway been smaller than the ones east of the big rever. Yotes like deer are smaller that far south then they are here in Western Canada. With the weather being so much warmer there would they maybe be inclined to breed year around there? Great Hunting, Clint. Drought has affected all. There was also a big die off of deer in the part of West TX where I hunt. The older, more mature deer didn't take the heat as well as the younger ones. A good day out Clint. I was hoping to hear that you were able to do something for the calf, but then again...that's life on a farm mate. Like the others I thought the coyotes were a tad smaller than I imagined...them being pups makes sense of it now. Well you're in the country where they started out. Do you have hogs out your way also or javelina? "Well you're in the country where they started out." What? Coyotes are originally a desert animal that were spread from the desert areas from old mexico into the desert southwest/great plains and on up to southern saskatchewan, southern alberta and a bit into manitoba. They are now all the way up to arctic red river in northwest territory and even on newfoundland.